For the first time in the history of my involvement with the school I work at, we have a Christmas tree. 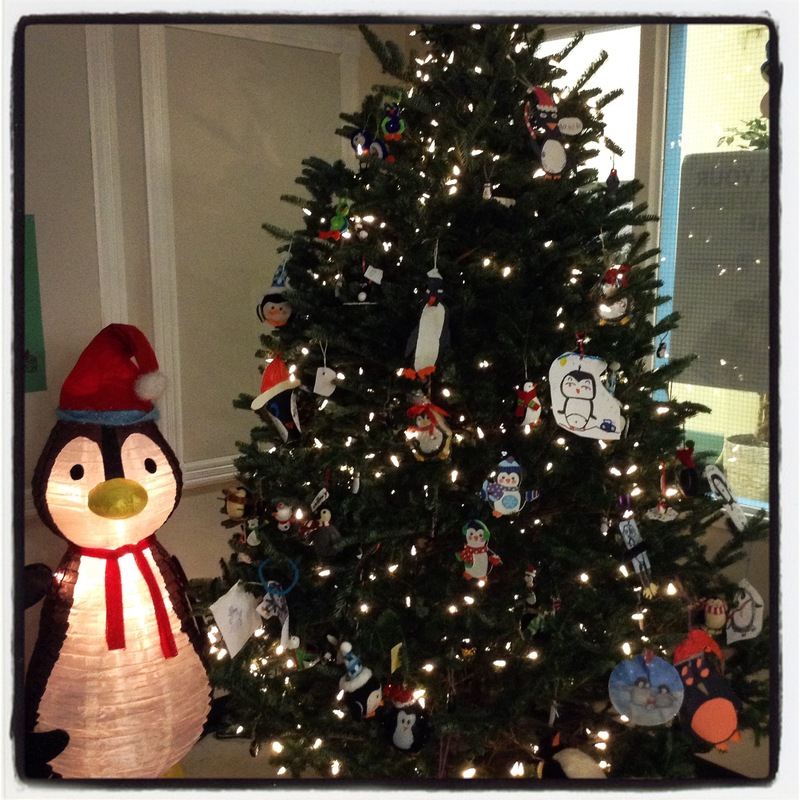 The tree resides in the office and is a freshly cut pine tree. I inhale the scent as I walk into the space and I cannot help but smile. This is my first experience of a freshly cut Christmas tree – and I am enjoying the experience. 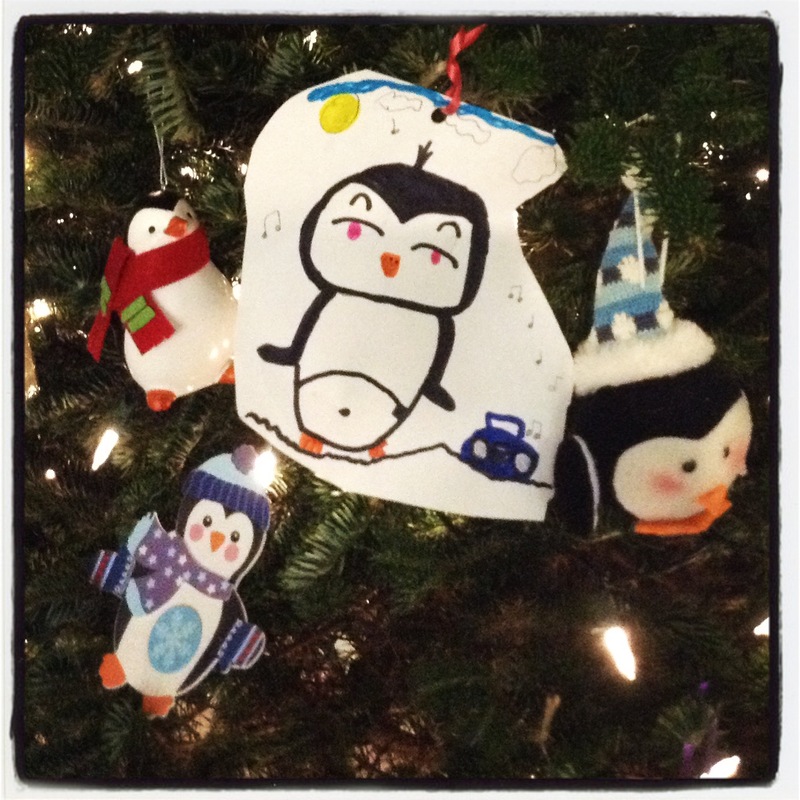 The tree is being decorated with penguin ornaments – made by the children or bought at a store. The sight is a pleasure to behold and one that will increase both the Christmas spirit and the school spirit. 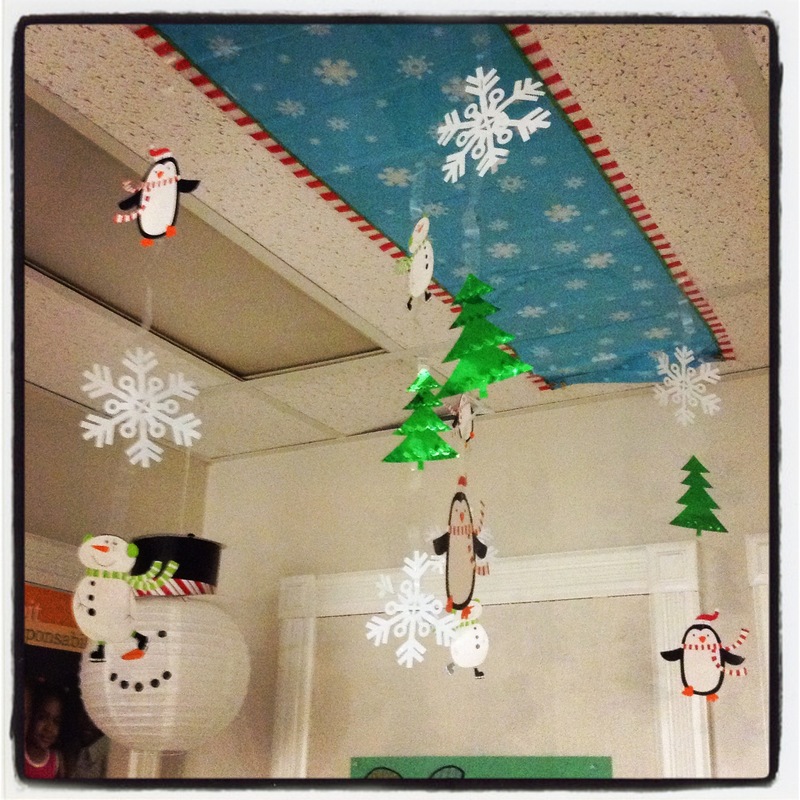 Even the ceiling of the office has been decorated to encourage the festive spirit in the school. This week I am grateful for an adminstration that is celebrating the tradition of many of the staff and students at our school. Last week Lavender Ladi was grateful for soft magic. How wonderful that the school is willing to have a live tree! What a treat to see that every day at work. We have a family tradition of cutting a tree every year for Christmas. The house is now filled with that pine scent. It’s heavenly! Love the Christmas tree. I was trying to figure out where you live? French, but not France? My entire tree is decorated with the contributions of my two children, over the years. They’re now adults, so I have quite a few! I love the ornaments that my children have mde for the tree over the years – they are truly treasures. As to where I live? Toronto in Canada. I teach at a French Immersion school. Well please come back and let me know how that idea comes out – and not sure if you have used Tacky the Penguin books yet – but a personal favorite children’s book is tacky the penguin – oh my goodness are they fun and the message of the stories teach social manners – and uniqueness – all with some humor – so if you want to take the penguin theme further you might want to skim these treasures – have you heard of them? No I haven’t. I wouldn’t be able to use them unless they are translated into French. I would like that Yvette. There really is nothing quite like a freshly cut Christmas tree. I bet for some of the children, this is there first encounter with one. It’s a memory I’m sure they won’t soon forget. Scent is such a strong trigger for memory. I think you are right John. We have quite a few immagrants in our school community and not all of them come from places that celebrate Christmas with a freshly cut tree. A beautiful aromatic tree Colline, and beautifully decorated by the Children. They must enjoy seeing their tree looking so lovely. They certainly do Ian. I need to take another picture soon as they keep bringing in ornaments every day. The tree is beautiful. How wonderful that the children are making ornaments for it. The tree is filling up nicely. I will take another picture of it later this week to show you.